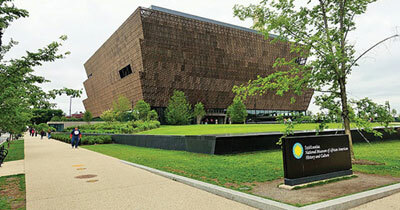 The National Museum of African American History & Culture. WASHINGTON, D.C. — Late yesterday, the American Freedom Law Center, a national public interest law firm, resolved an important First Amendment case against the federal government in favor of several pro-life demonstrators who were prevented from expressing their pro-life message outside of the National Museum of African American History and Culture (NMAAHC) in Washington, D.C. The lawsuit was filed on behalf of the Center for Bio-Ethical Reform, Inc. (CBR), a California-based pro-life organization, its executive director, Gregg Cunningham, Reverend Clenard H. Childress, Jr., an African American pastor and assistant to National Director Rev. Dr. Johnny Hunter of LEARN (the Life Education And Resource Network), the largest African American Pro-Life Network in USA, and Jacqueline Hawkins, an African American woman who is the director of minority outreach for CBR. Pastor Childress and Hawkins direct the NMAAC project, which was developed by CBR in collaboration with LEARN. The NMAAHC project involves the use of hand-held, photo-mural exhibits that demonstrate the devastation of abortion’s consequences on the African American community. This project also includes the distribution of literature. A principal goal of the project is to raise awareness of the Black genocide that is being perpetrated through abortion. This past February, Pastor Childress and Hawkins initiated the NMAAHC project by peacefully standing outside of the museum entrance on the public sidewalk adjacent to Madison Drive with one of the project signs. Cunningham was present as well. Shortly after they arrived, Pastor Childress and Hawkins were confronted by an NMAAHC official and several armed, uniformed police officers from the Office of Protection Services (OPS) who told them that they could not stand outside the museum with their sign. Reverend Childress responded that this is a public sidewalk. The senior OPS officer warned Pastor Childress and Hawkins that if they did not move to a remote location across the street, then he and his fellow officers would physically move them. The OPS officer also confirmed that if they did not move, they would be subject to arrest. Rather than face arrest or physical force, Pastor Childress and Ms. Hawkins ceased their First Amendment activity and moved per the officer’s order. Rev. Clenard H. Childress Jr, stated, “What should be a institution that enlightens the public of the rich history and meaningful contribution of African Americans has turned out to be a citadel of subliminal bias, discrimination and coercion. This past June, AFLC filed a federal lawsuit in the U.S. District Court in Washington, D.C. against NMAAHC, OPS, and several federal officials. Shortly after the lawsuit was filed, AFLC attorneys were contacted by an attorney from the Department of Justice who confirmed our clients’ First Amendment rights and who stated that the federal government wanted to settle the case on terms favorable to our clients. Yesterday, the parties filed a stipulated dismissal in which the federal government formally acknowledged “that the public sidewalks forming the perimeter of the National Museum of African American History and Culture are available for First Amendment activity” and agreed to pay AFLC its attorneys’ fees incurred for having to file the complaint.